LET THE AIR LIFT YOU UP! Love the shape and size of our FlexPro Power, but would rather not have to plug it in? 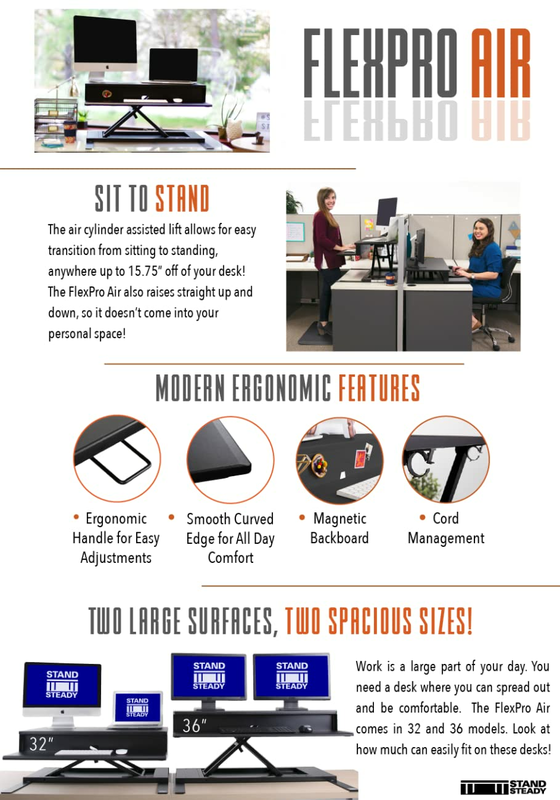 The FlexPro Air 32" Sit Stand Desk Converter is calling your name! It offers all the benefits of its powered sibling but features a super convenient (and more cost effective) pneumatic lift. PNEUMATIC LIFT: Effortlessly transition from sitting to standing in seconds! Simply pull the lever on the right side of this adjustable desk riser to place it at your preferred height. STURDY & SLEEK: An adjustable height desk you can trust! Its strong base can hold up to 25 lbs.! More than enough for most monitors, as well as your favorite accessories. FULLY ASSEMBLED: We’re here to make things easier for you – so it’s already assembled with love and care. Just open the box and STAND. Look no further – you’ve found your standing solution! Does what it is supposed to and no problems after a few weeks. No problems setting up and easy to use. Also came fully assembled. Already assembled and in expensive. Fits needs of a stand up desk. This is a very heavy product. There was no assembly needed. It is not too hard to lift, but I can tell that it may be harder for me to use in the future since I have some right shoulder issues. It is sturdy & holds 2 monitors easily. I like the fact that there is a solid piece between the 2 levels to keep pens, etc. from rolling back. The cord holders are nice also. It did lift the monitors enough that I now need a new chair. I didn't realize that I was looking "up" at the monitors but it is more exaggerated now & leading to neck strain if I sit long. This is just the desk I was looking for. It adjusts to the height that I need it, it is moderately attractive, and it is easy to raise and lower. It is very sturdy and pretty heavy, but I think that's okay because you feel like you have a solid piece of equipment to use. As expected, I have had people ask me about it and they want to get their own. It is definitely worth the money. Nice for standing up after sitting a while. Especially with back issues. I like the height even at the lowest level when I am sitting. However, it is a little hard to raise with the computer on it. But I am not very strong so a younger person my not have an issue. I am a 78 year old female, so that could make a big difference.